How Much of Your Phone is Actually the Screen? “Bigger screens and smaller bezels” have been the touted design mantra for most Android devices over the past few years, but how much screen are we actually getting? @somospostpc did a little bit of the number crunching for us and gives us the the percentage of space that the actual display takes up on the front of most of the top Android smartphones. It is not a surprise that we see some of the latest and most highly regarded Android phones out right now have the largest percentages of display to bezel. 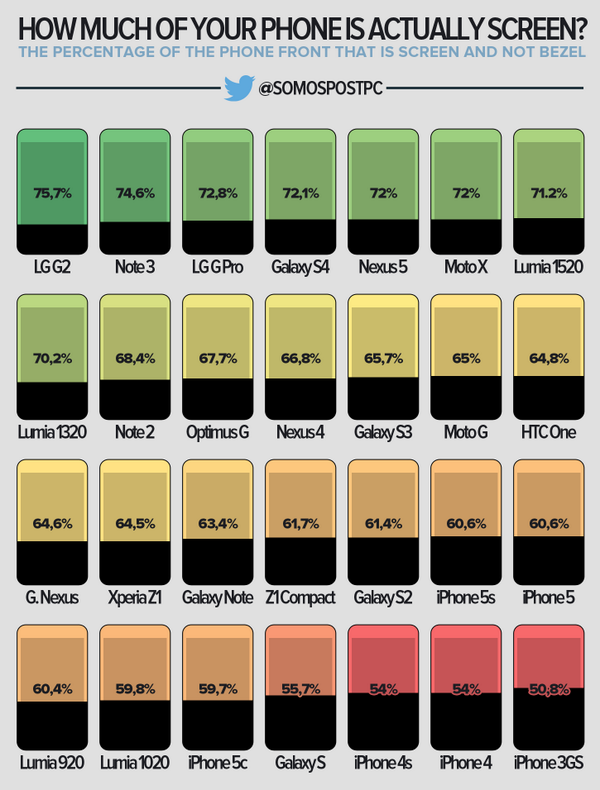 While the LG G2 takes the top spot, the Moto X, Galaxy S4, and Nexus 5 are all near the top in terms of display percentage. How far do you think Android and Google can push this percentage?